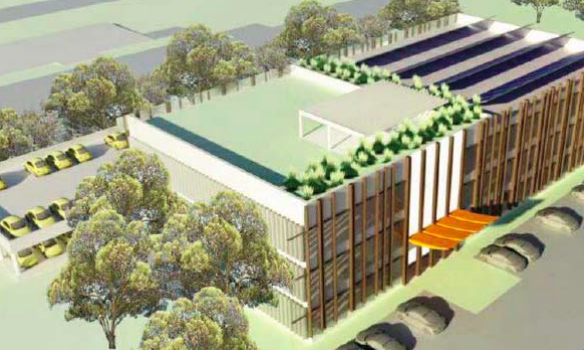 An application to develop a commercial building and ancillary multilevel carpark at 1-10 Amy Cl, Wyong, valued at $6m, has been placed on exhibition by Central Coast Council. The DA proposes the construction of a three-storey commercial building, with a rooftop garden and a three-level car park. The commercial building would be located within the central portion of the site, which is currently vacant. It would comprise of: carpark 1 with 55 car spaces; Level 1 with 1,200 square metres of commercial space and 54 car spaces (Carpark 2); Level 2 with 1,200 square metres of commercial space and 52 car spaces (Carpark 3); Level 3 with 1,200 square metres of commercial space; and the roof garden and solar collectors. The rooftop garden and solar collectors proposed are best practice in terms of sustainable development. The site currently accommodates an existing, well-established, commercial and retail complex, known as the Golflinks Commercial Campus. It is accessed off Amy Cl, which is a private road, according to the Statement of Environmental Effects (SEE) submitted to support the DA. “It is situated on the northern side of Pacific Hwy, directly opposite Wyong Golf Course,” the SEE said. “An existing landscape buffer, containing a variety of mature eucalyptus and angophoras, including additional landscape plantings, separates the site from the Pacific Hwy road frontage. “The site is a split zone parcel, consisting of B6 Enterprise Corridor, E2 Environmental Conservation and E3 Environmental Management, under the provisions of the Wyong Local Environmental Plan (WLEP) 2013. The total site area is approximately 14.5 hectares, with the B6 portion of the site approximately 7.9 hectares in area. It is partially bushfire prone land and partially flood affected. The northern sector of the land contains some SEPP 14 – Coastal Wetlands, and sits within the State Environmental Planning Policy No. 71 (SEPP 71) – Coastal Protection. The site currently accommodates a number of buildings, including a child care centre, a service station, car wash and Building 9, which includes Chemist Warehouse. “The area of the site specific to the proposed development is in the centre of the site, to the west of Amy Cl, and is relatively flat,” the SEE said. According to the SEE, the E2 and E3 portion of the site will not be disturbed; and although the site is mapped as bushfire prone land, the nature of the proposed development does not warrant an assessment in accordance with Planning for Bushfire Protection 2006. “The proposed development generally complies with Council’s standards and requirements,” the SEE said.